It’s human nature to want to grow within a role. Job satisfaction isn’t static–it changes over time. A job that you felt lucky to get at 20 will likely not be as fulfilling once you enter your thirties. That’s why personal development should matter to companies that want a motivated and productive workforce. Personal development activities ensure that employees can see a clear path forward between where they are now and where they want to be. People that know they have a valuable role to play in your organization’s success, and an attractive future within it, will stay with your company longer. Career advancement or promotional opportunities is one of the top reasons that employees leave a company. Gallup research shows that 32% of employees leave a job for a career advancement opportunity. The report also discovered that 87% of millennials say professional development or career growth opportunities are very important. Millennials are faced with a potential future within a gig economy, so a company that provides a real opportunity for advancement can easily stand out amongst their available career options. 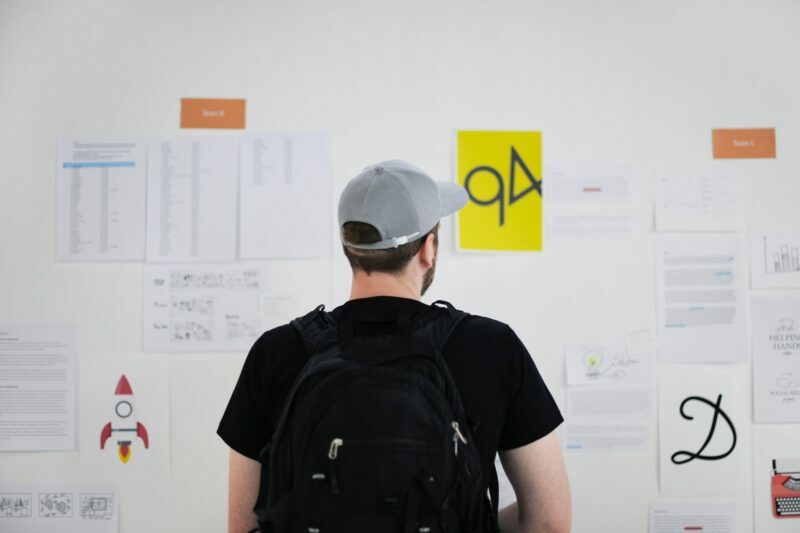 One of the best predictors of turnover is whether an employee feels like they have room to grow and advance within a company, and engaged employees are twice as likely to recognize that they have opportunities to move up within their company. Timing plays a critical part in how fulfilled an employee is in a position, how much effort they are willing to put in, and how motivated they are to do what’s necessary for advancement. An employee that recently graduated college might not feel as tied to a company as a new parent. Year-over-year raises might not be as important to junior employees as opportunities to flex their skills. Understanding how timing influences personal development can help employers relate to their employees and, in turn, create development opportunities that feel customized for them. In 1980, a writer named Donald Super introduced a model he called The Life Career Rainbow. It’s a structure for understanding and balancing an employee’s self-concept in the context of their personal and professional lives. 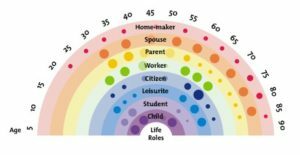 The Life Career Rainbow marks a person’s “Life Roles”–Child, Student, Leisurite, Citizen, Worker, Parent, Spouse, and Home-maker–on a continuum of career stages. 1. Growth (ages 14 and under): Physical growth is a top priority in this life stage. In the Growth stage, people are figuring out who they are, and where their talents and interests lie. 2. Exploration (ages 14-25): In this stage, people are starting to try on different roles that may or may not be the career they choose long-term. They learn what is required in certain positions and what are willing, or not willing, to accept as part of their job. By the end of the exploration stage, most people will have focused their attention toward a specific career area and settled on some expectations for their preferred position (in terms of salary, hours, benefits, etc.). People might be disabused of their fantasies or preconceived ideas about their desired career. It is not uncommon to return to this stage later in life to pursue a different career. 3. Establishment (ages 26-45): By this time, people are settling down in their chosen careers. They are productive, motivated, and feel a sense of fulfillment from their jobs. Early on in this stage, workers might find a mentor that models where they want to see their career go. People understand the culture and social mores of the workplaces that they will occupy throughout their career. They feel a sense of responsibility and ownership for the work they produce. 4. Maintenance (ages 46-65): Employees at this stage want to maintain the momentum they achieved so far in their career. They will take part in training sessions, attend conferences, and read trade news to stay up-to-date in their jobs. As senior employees, their mistakes aren’t forgiven as easily and they are likely responsible for more than just their own performance. 5. Disengagement (ages 65 and up): After decades in the workforce, people in this stage are starting to wind down from their work. They no longer see themselves as a worker and would rather step into the roles of leisurite, home-maker, and citizen. They are clearing tasks off their desk before they retire. Firstly, encourage managers to mentor and coach their employees. The supportive role of management has diminished somewhat in recent years, due to increased responsibility and work. It’s become necessary to incentivize and support your management in sharing their skills and knowledge with their employees in a more structured way in order to encourage long-term development. Incorporate a continuous campaign of skills and knowledge development across your company. Information becomes obsolete at a faster rate than ever before, so it’s crucial that companies make learning a nonstop goal. However, be mindful of your employees’ workload: don’t force overworked employees to take on more obligations when it comes to their personal development. Instead, allow employees to opt into development opportunities and make them as flexible as possible. Consider adopting mobile or on-demand options to better adapt the system to employees’ busy schedules. Build trust in your company’s leaders. A survey by the American Psychological Association shows that nearly half of workers don’t feel that their employer is open and honest with them, and one in four claim to not trust their employer at all. This lack of trust inevitably leads to issues with motivation when it comes to personal development. Employees crave the reliability of a management team that leads by example, not a “do as I say and don’t ask uncomfortable questions” approach to leadership. Be the company that attracts talent through a culture of honesty and transparency. Encourage a culture that empowers employees to steer their own career development. With five demographic generations of employees in the workplace at once, spanning from Traditionalists to Generation Z, a one-size-fits-all approach to learning at work doesn’t cut it anymore. Employers can set the values and cultural framework that encourages and rewards every employee for their personal development. Approach the topic with the goal of maintaining scalability and cost-efficiency while providing a range of personal development plans that are flexible enough to benefit employees no matter their age, seniority level, or function. Investigate opportunities to job shadow other employees in your company. Observing other roles can give you a more holistic view of the mission of your company, while giving more context to your role and value in the organization. You can learn new skills, software, and systems by stepping into someone else’s shoes, making yourself more valuable to your company. Explore lateral moves to broaden your experience. It’s easy to get stuck in a rut doing the same job every day. Migrating to a new position can reignite your motivation and add some variety to the projects you accomplish at work. The experience and skills you gain from your new role, as well as your open-minded, team-player attitude, can make you that much more attractive for future promotions. Attend classes and training sessions to deepen your knowledge. New strategies and technologies are constantly being launched across many industries and fields. Stay up-to-date on your job and industry. A new innovation that you’ve read about might be useful in your next big project. Find a mentor that you respect. Mentors can be encouraging models for where you would like your career to go. Ask a senior employee whose work you admire out for a coffee, or ask if you can run an idea by them. They will likely be flattered by the overture and try their best to help. Leaning on someone else’s experience is a great way to gain knowledge and introduce yourself to other opportunities. See how your company can support your education. Many companies now offer tuition assistance programs for Bachelor and MBA programs. If you’ve been thinking about going back to school, your company might want to invest in your future skills and knowledge. Lastly, ask yourself: is there a topic that you’ve studied that you would like to share? Others within your company can benefit from your specialized knowledge, so put together a presentation to teach your coworkers about something you’ve learned. Doing so can inspire others to do the same, and will certainly attract the attention of upper management. Whether you would like to help employees meet their personal development goals, or you’d like to develop yourself, it’s important to understand where you are and what you define as success. By understanding what employees want at certain stages of their career, you can help to foster an environment that allows them to flourish. Personal development doesn’t look the same for every employee, but every employee has to be responsible for initiating their personal development plan themselves. Give your employees the time, space, and resources to grow into their best selves with you.